South Africa is a country with diverse wildlife. The country has over 300 mammals and over 900 species of bird. Some of these species are kept in zoos and theses zoos are in the country. These include the likes of Johannesburg zoo, Pretoria zoo, Tygerberg zoo. In this post, we will take a look at these zoos. The Johannesburg Zoo is a 55-hectare (140-acre) zoo that is located in Johannesburg, South Africa. It is dedicated to the enrichment, accommodation, husbandry, and medical care of wild animals, and it houses about 2000 individuals of 320 species. The zoo was established in 1904 and has been traditionally operated by the Johannesburg City Council. However, the zoo has been turned into a corporation and registered as a Section 21 non-profit organisation. The Pretoria Zoo which is also known as National Zoological Gardens of South Africa is an 85-hectare (210-acre) zoo that is located in Pretoria, South Africa. It is known as the national zoo of South Africa and was founded in 1899 by J. W. B. Gunning. Pretoria Zoo is one of the eight largest zoos in the world and one of the most highly-rated. This zoo is known as Mitchell Park or Mitchell’s Park and is situated in the Morningside suburb of Durban, South Africa. It is the only zoo in Durban. The Mitchell Park Zoo was originally established as an Ostrich farm in 1910, but was unprofitable and started adding other animals. It was at one time home to many large animals, the most notable of which was an Indian Elephant named Nellie. Nellie was given to the zoo by the Maharajah of Mysore in 1928 and could blow a mouth organ and crack coconuts with her feet. Lion & Safari Park is a 600 hectare wildlife conservation enclosure located in Gauteng province in South Africa that is meant for lions. The park has a large variety of predators and large herbivores indigenous to Africa. The Lion & Safari Park is home to over 80 lions which includes the rare white lions and many other carnivores such as the South African cheetah, Cape wild dog, hyena and spotted hyena, and black-backed jackal. This is a bird zoo that is located in Durban, in the province of KwaZulu-Natal, South Africa. The zoo was designed and built by Dr Alan Abrey in 1984 and was run by him until his retirement in 1997. It is home to over 300 species of birds. World of Birds Wildlife Sanctuary and Monkey Park which is often shortened to World of Birds is an avian, reptilian and wildlife sanctuary that is situated in Hout Bay, a suburb of Cape Town in South Africa. Just as its name implies, the focus is primarily on birds and monkeys. It is the largest African bird park and among the bird parks in the world with a higher number of species. This is a zoological park that is located in Drakenstein, Western Cape, South Africa. 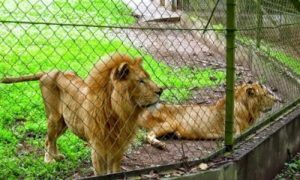 The zoo was established in 1998 for the primary purpose of keeping lions which could not be rehabilitated into the wilderness and was meant to replace the now-defunct Tygerberg Zoo. Other animals that are housed in the zoo include chimpanzees and tigers, including some from Novosibirsk Zoo, from where Tygerberg’s director John Spence managed to obtain his lions.